Posted in: 2 Shout-out-Looks. Tagged: Janina San Miguel, Jennifer Barrientos, Patricia Fernandez, Vishal Sahota. Congratulations are in order for former Bb. 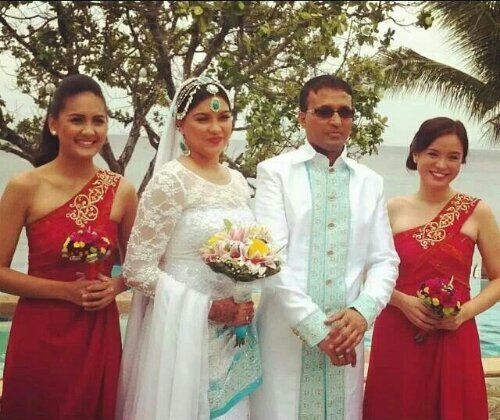 Pilipinas World Janina San Miguel (she was replaced by Danielle Castano after resigning from the crown) who is now married to Indian national Vishal Sahota. While the tall and charming lady may have become fuller due to pregnancy, she is evidently a picture of happiness and serenity. By the way, she was joined during the wedding by close friends Bb. Pilipinas Universe 2008 Jennifer Barrientos and Bb. Pilipinas International 2008 Patricia Fernandez. Good for janina. Still pretty even though she added weight. You are always and forever be l in my taf 10. Fingers-crossed that her firstborn would turn into one stunning tall lady willing to be part of the Philippine Pageantry. Congratulations Mr & Mrs Vishal Sahota and good luck to your new journey, Janina! Norms, I think and believe you do wish Mrs. San Miguel-Sahota well, and I write this with the most profound respect for you. “Dethroned” is a mighty word with severe connotations. While I’ve read lots of whisperings behind the scenes, Janina still submitted her resignation. I dare say that perhaps she wasn’t committed wholeheartedly to her training sessions, and amidst such social mockery for her less-than-stellar Q & A, she probably had a very difficult time as Bb. Pilipinas World, not to mention, dealing with the loss of a grandparent. I’m going to chalk it all off to her youth and naiveté, because she was such a young country bumpkin then. Like Aishwarya Rai, I suppose any former beauty titleholder will always be under public scrutiny for any pounds gained, but I wish Janina’s pundits would be more forgiving. It’s bad enough that her shortcomings at Q & A will stand immutable through time, thanks to the internet. Must her weight gain always be an issue? I don’t know Janina from Jack, but she may never again be as thin as she was back then, and that’s OK. (It doesn’t bother me; why does it bother others? She never represented us at an international pageant to our disgrace.) What matters is that she’s loved. If the bridesmaids are any indication, she must be a decent enough person, despite the “more than enough pounds gained,” to have kept two former binibini titleholders as friends. Sayang ang babaeng ito, masyadong bata pa kasi nung sumali sya sa BBP. Pero yung ganda at tindig nya panalong panalo. Nakakapanghinayang sana hindi na lang sya nag-resign at nagtraining na lang, malaki sana chance nya sa Miss World. Off topic tito Norm. Si bianca paz ba nagback out during screening ng Bb Pilipinas? Nalilito kse ako sa knila ni Mary Ann Misa. Anyway, kala ko di muna sya join sa pageant. ? OC na pala silang dalawa sa Miss Phils Earth? Sila ni Misa. It was Mary Anne Misa who backed out of BBP. Thanks Tito Norm. OC na silang dalawa sa MpE. i’m very sure she did not feel nervous n her wedding 😀 best wishes and congratulations!